We usually spend more uninterrupted blocks of time in the bedroom than in any other room in the house. While sleeping, we are in close contact with our mattress, pillows and other bedding, so it is important to keep these items as disinfected as possible for overall good health. Disinfecting goes beyond regular cleaning because it kills disease-causing microorganisms like bacteria, fungi and viruses. The bedroom should be disinfected weekly or monthly, as necessary. If the bedroom is being used as a sick-room, then it should be disinfected more often. 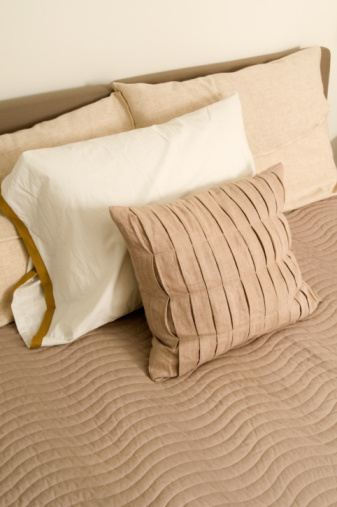 Disinfecting a bedroom doesn't have to be difficult. Remove the pillows and sheets from the bed. Wash sheets and pillowcases in hot water. Vacuum the pillows and then steam them or spray with a disinfecting spray until damp. Let the pillows dry. Vacuum the mattress on each side and then steam each side or spray with a disinfecting spray until damp. Let one side of the mattress dry before steaming or spraying the other side. Vacuum the curtains and then either steam them or spray with the disinfecting spray until damp. Steam or use disinfecting wipes on hard surfaces like the door knobs, window sills, furniture pulls/knobs and allow the surfaces to dry. Vacuum the floor and steam (or spray) carpeting and rugs.